Vertical construction is underway at Velero on the shore of the New River in the historic Sailboat Bend neighborhood in downtown Fort Lauderdale, Fla. 170 yards of concrete was poured today at the four luxury villas with 2 car garages and the concrete block walls will begin starting this week. "More than 63,000 lbs. 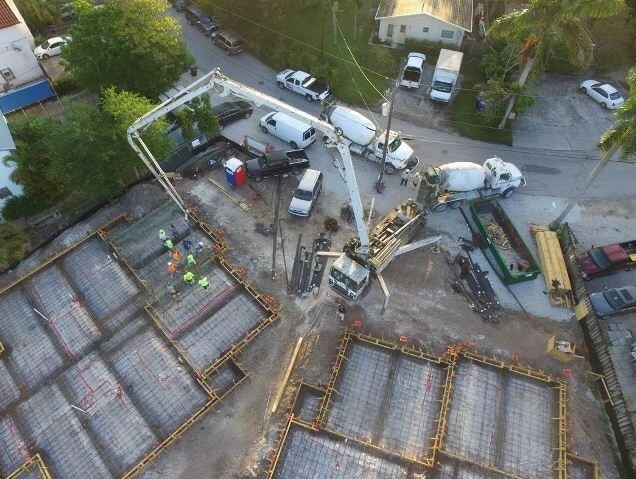 of structural steel for the foundation, which sits on top of pilings that have been embedded 32 feet into the bedrock, created an unbelievably intense concrete pour," added Stellar Homes Group Vice President Tony Valle. Velero at Sailboat Bend is an exclusive enclave of four residences featuring 4-bedroom floorplans with 2,290 square feet under air, two-car garages and a private deeded dock for each. The villas are priced from $778,400 and completion is expected by mid-September, 2016. Stellar Homes Group pours foundation for Velero in historic Sailboat Bend, Fort Lauderdale. More than 50 real estate professionals attended a special preview on March 24 and were impressed with the product. "These homes are literally rejuvenating the heart of old Fort Lauderdale. High-end buyers will appreciate luxury residences that are electric vehicle - and solar power-ready," stated Realtor Tony Smith. Additional luxury features include 10 ft. ceilings on first and second floor, gourmet kitchen with large island, spacious master suite and great room overlooking the balcony. Velero's landscaping includes native plant species, living coastline landscaping and an organic vegetable garden. Nestled on the New River shoreline, each home will also come with a boat slip and custom dock that have a water and lighted power station pedestal as well as access straight to the Atlantic Ocean without any fixed bridges. "Sailboat Bend is undergoing a significant transformation and Velero complements this trend with an innovative combination of urban living and waterfront relaxation," added Stellar Homes Group Managing Partner Larry Baum. "We sought to complement the neighborhood and yet offer a unique lifestyle to our owners." Velero residents will be able to walk to shops at famous Las Olas Boulevard, great cultural venues such as the Museum of Discovery and Science and all the excitement of downtown, while preserving privacy and comfort in their own homes. Founded in 2009, South-Florida-based developer Stellar Homes Group has delivered more than 2,000 homes and is committed to building residences that offer stellar quality, contemporary designs and sustainability. Stellar Homes Group specializes in the acquisition, development and value enhancement of residential and mixed-use properties. The company has developed in some of the most desirable coastal, urban and suburban locations in South Florida and is proudly dedicated to maintaining Florida Green standards and following green building practices to minimize the impact to the environment while reducing energy and water costs for residents. For more information about Stellar Homes Group visit www.stellarhomesgroup.com. For details about Velero at Sailboat Bend visit VeleroHomes.com.